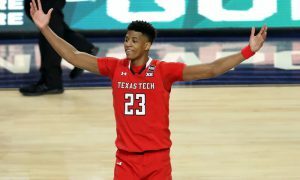 The first round of the National Invitation Tournament and the College Basketball Insider Tournament proved fertile ground for the Big 12, as Texas, TCU and West Virginia went a combined 3-0 and now host second-round games starting on Sunday. 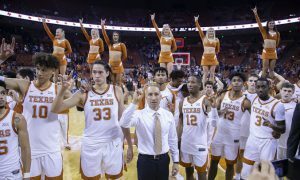 On Tuesday, Texas (17-16) moved a game over .500 with a 79-73 win over South Dakota State in Austin, Texas. The Longhorns exploded out of the gate with a 19-0 run and then maintained that lead the rest of the game, though the Jackrabbits were, at times, within a possession of tying the contest late and briefly had the lead with about nine minutes remaining in the game. The Longhorns didn’t do a good job of keeping the lead, but they’ve had trouble hanging onto large leads all season. A good example is the Baylor game last month. Texas now hosts Big East school Xavier at 3 p.m. CST on Sunday in Austin. The Musketeers beat Toledo, 78-64, in the first round. Texas is going to have to find a way to deal with Musketeers forward Naji Marshall, who had an incredible night against the Rockets, notching 20 points and a career-high 21 rebounds while three other Xavier players hit double figures. Marshall has averaged 14.5 points and 7.2 rebounds per game this season. Paul Scruggs and Ryan Welage, the latter of which normally comes off the bench, are the Musketeers’ top 3-point shooters. But, as a team, Xavier doesn’t shoot well from distance. Texas also received a gift during the first round in the form of Norfolk State’s upset of Alabama. The Crimson Tide were the No. 1 seed in Texas’ side of the bracket. So if the Longhorns win on Sunday they’re guaranteed a third straight home game, a quarterfinal contest for the right to go to Madison Square Garden for the NIT Final Four. If Texas wins it would face either Norfolk State or Colorado. 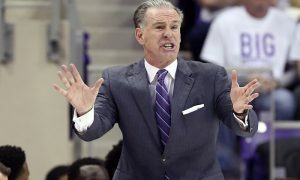 TCU (21-13) defeated Sam Houston State, 82-69, on Wednesday night to force a second-round matchup with Nebraska at 8:30 p.m. on Sunday. The Horned Frogs are No. 1 seed in their side of the bracket, so a victory over the Cornhuskers ensures TCU of one more home game. 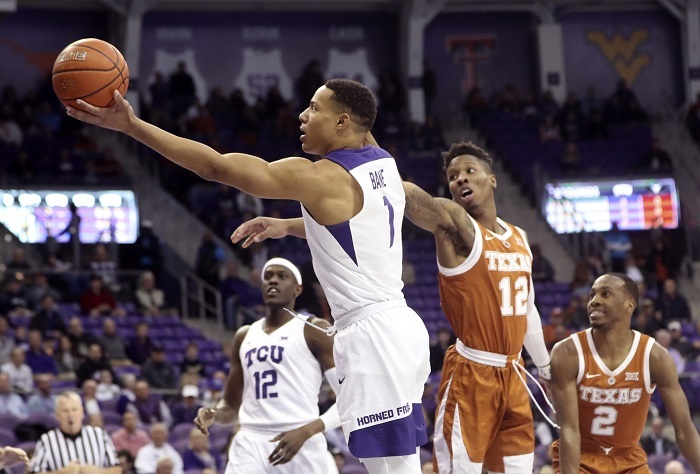 The Horned Frogs beat the Bearkats on the strength of one of its most balanced offensive nights of the season, as six players hit double figures — J.D. Miller (15), Alex Robinson (13), Desmond Bane (13), R.J. Nembhard (12), Kevin Samuel (11) and Kendric Davis (10). Robinson ended up with a double-double, adding 11 assists. Nebraska (19-16) is coming off an 80-76 win over Butler in the first round, punctuated by a 28-point night by Isaiah Roby and a 23-point night by James Palmer Jr. Glynn Watson Jr. added 11. What’s curious about the Cornhuskers is that those three players played all 40 minutes against Butler, indicating that Nebraska may actually have less depth than TCU, which regularly plays seven. Part of Nebraska’s depth issues stem from losses like Isaac Copeland, Thomas Allen, Nana Akenten and Brady Heiman. Yet the Cornhuskers have proved to be one of the most resilient teams in college basketball the past two weeks, as they won two games as a No. 13 seed, including an upset of No. 5-seed Maryland, before falling to Wisconsin. If TCU wins it would host either Memphis or Creighton. Then, on Monday, West Virginia (15-20) hosts Coastal Carolina in a second-round CBI contest. Jermaine Haley had 24 points to lead the way for the Mountaineers in their first round, 77-63 win, over Grand Canyon. Emmitt Matthews Jr. and Lamont West each had 11 points while Chase Harler added 10. Derek Culver had 10 rebounds. The Mountaineers are now 5-3 since their triple-overtime win over TCU on Feb. 26. The Chanticleers (16-16) beat Howard, 81-72, in the first round. Tyrell Gumbs-Frater came off the bench for Coastal to lead with 22 points, while Zac Cuthbertson had 18 points and 13 rebounds. Ebrima Dibba added 13 points. Coastal is 3-3 since Feb. 26. The rest of the quarterfinal CBI games feature Central Michigan at DePaul, Brown at Loyola Marymount and Utah Valley at South Florida. After the quarterfinals the teams are re-bracketed, so should West Virginia win it would find out its opponent shortly after Monday’s result, followed by a semifinal game on either March 27 or 28.